We were moving stuff out of the house the other day and came back inside to see Theo and Nahum owning the end tables! Silly boys! Cute!! I love these guys! Oh my gosh! Look how high up you guys got ;) Be careful! Sadly, both beautiful Manitou, on top, and Mr.Poole below, have departed for the Rainbow Bridge. Photos such as these are great memories. Thanks for reminding me. Hope all goes well for you re. house/job. 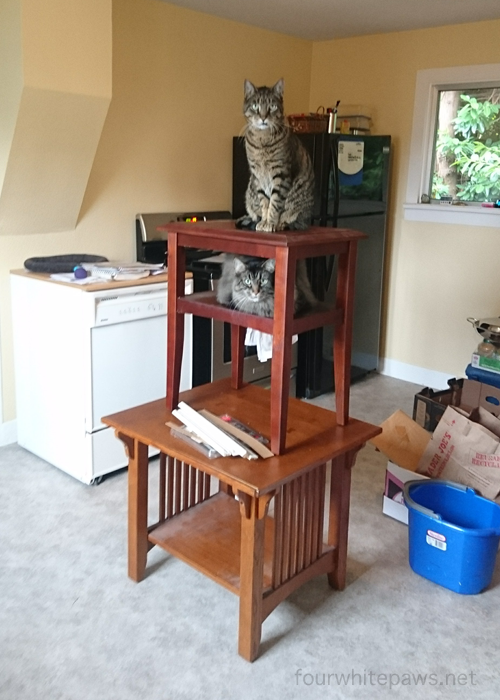 They are claiming their territory...high up!